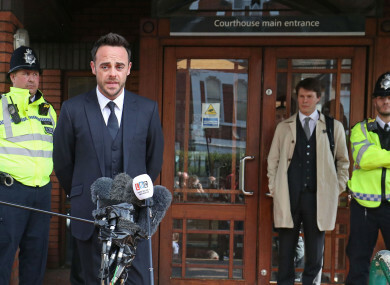 ANT MCPARTLIN APOLOGISED on his way out of court today saying he was ”ashamed and mortified” and “accepts full responsibility” for what happened. The presenter pleaded guilty to driving more than twice over the legal alcohol limit. He has been banned from driving for 20 months and received a fine of £86,000 (€99,500). The driving ban can be reduced to 15 months if he attends a drink driving referral scheme by 16 May. The 42-year-old stepped away from his TV commitments following a collision with two other cars in London last month. A young child was taken to hospital as a precaution after the collision. “I just want to say I’m truly sorry for what happened. Higher standards are expected of me, I expect them of myself. I let myself down, I let a lot of people down and for that I’m truly sorry. Email “'I'm truly sorry': Ant McPartlin apologises for drink-driving crash ”. Feedback on “'I'm truly sorry': Ant McPartlin apologises for drink-driving crash ”.